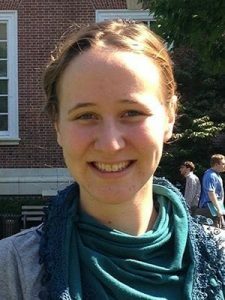 Join us in congratulating fourth year PhD student Jane Lutken for receiving an NSF Doctoral Dissertation Research Improvement Award to pursue her research project on “Cross-Linguistic Investigations of Syntactic Creativity Errors in Children’s Wh-questions” in Germany next year. Being awarded such a grant on the first attempt is rare! Jane’s project will investigate children’s errors during production and comprehension of questions with multiple clauses. The goal is to ascertain whether the source of these errors lies in their grammatical knowledge of the language they are learning or in other cognitive skills such as memory, planning, and attention. The cross-linguistic examination of such errors will also inform our understanding of the role of linguistic input as well as what biases children bring to the task of language learning.